Dr. Susan Battley, an elite Fortune 100 executive coach and leadership psychologist, has helped hundreds of CEOs, senior managers, and business owners raise their leadership effectiveness in high-stakes situations. In COACHED TO LEAD: How to Achieve Extraordinary Results with an Executive Coach, Dr. Battley has written the first consumer's guide targeted to the coaching client's information and performance needs. Executive coaching can dramatically boost a top achiever's performance and career prospects. Fortune Magazine reported, "In a recent study, training alone improved leadership skills by 22%. When combined with executive coaching, improvement jumps to 77%." Drawing on twenty years of experience and direct research with CEOs and other global leaders, Battley reveals the insider secrets and myths about coaching-who is a qualified coach and who isn't, how to contract and structure your coaching program, the science behind coaching success, and how to identify and measure results that really matter. At the heart of COACHED TO LEAD is Battley's conviction that leaders and those aspiring to leadership positions - whether they are corporate executives, technical professionals, academics, public officials, business owners or middle managers - need to understand how customizable coaching services can supercharge their success in rapid-change and highly competitive environments. Because the executive coaching field is a relatively new and evolving field, she provides evidence-based strategies, best practices, and actionable checklists and resources that will transform readers into confident consumers and sponsors of coaching services. Actual client cases and exclusive CEO interviews illustrate key points and real-world applications. Whether you are a CEO, college president, entrepreneur, non-profit director, military or public safety official, or a superstar on the way up the corporate ladder, COACHED TO LEAD will enable you to become a better leader faster with quality coaching services. 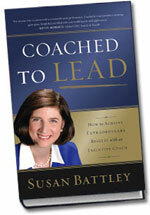 "With professional precision, Battley has opened up issues involved in executive coaching and creates a book of answers that can improve the counseling of leaders in any industry.... She offers a coaching model and tools that can promote deep changes and positively influence any executive and his or her organization's performance." "Coached to Lead is a flight plan for high-altitude success. Battley distills her years as a trusted CEO adviser into performance-boosting strategies and solutions. Whether you are a top executive, a rising star, or a coach yourself, don't take off without this book." "This book has a high 'reality quotient' in terms of practical application and business impact. Battley brings a refreshing genuineness to explaining how leaders think and act. Insightful and results-oriented." "Highly recommended to executives at the front end of a coaching engagement, to coaches, and to HR procurers and generalists. In quite a few places I found myself saying, 'That's a good idea' or 'That's a good checklist for a client or a coach to go through.' This book will be a big hit in the marketplace. I wish I'd written it!" "Coached to Lead will turn cynics and skeptics of coaching into believers and supporters through its evidence-based approach and specific examples. It's a must read for anyone considering coaching as a career booster - and for coaches too. If you have questions, this book has answers. It's destined to win acclaim as the complete client primer on executive coaching." "If you have ever considered retaining an executive coach for yourself or someone else, Susan Battley's book will guide you to winning results. It's a must read." "After 25 years in management at RCA and FedEx I came to realize how important coaching is in developing and unleashing one's leadership potential. I highly recommend this book to fellow managers." Copyright ©2006-2019. Susan Battley, PsyD, PhD. All rights reserved.